When I was a child I had a book entitled ‘The Secret Garden’. In this book a young girl finds this place, an abandoned, beautiful secret garden. The story depicts her adventures in this secret place where she can be herself and be alone. The Bible also speaks of a secret place. It is a place that we as Christians are meant to discover. It is a place near to God where we can be ourselves and a place where we can enjoy God. God wants us in the secret place He has designed for each of us. 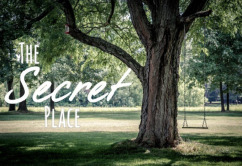 The secret place is a place in God. It is a place where we can be totally at home with God. It is a place to which we can keep on returning. It is a place where we can enjoy being with God. A place where we can worship and love God. Psalm 91:1 He that dwells in the secret place of the most High shall abide under the shadow of the Almighty. It is the character of a true Christians that he finds and dwells (stays) in the secret place of the Most High. There is a secret place for you and for me.